Budweiser, the official beer of the 2014 Fifa World Cup, has launched two experiential campaigns which form part of its wider Rise as One World Cup campaign. The first campaign, the Budweiser Challenger, creates an in-store theatre experience in supermarkets across the UK and is aimed at bringing consumers closer to the Fifa World Cup. It will task consumers with collecting as many branded balls as possible in an allotted time, with the number of balls collected determining the level of prize awarded. Official Fifa World Cup branded gifts will be available exclusively through the activity as Budweiser looks to reward its loyal shoppers. 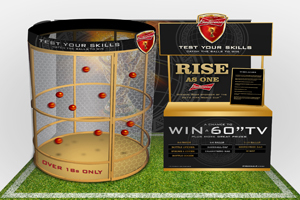 The first phase of the Budweiser Challenger was completed last month in Tesco stores throughout the UK, with Budweiser planning the second phase rollout during the football tournament. The second phase will be live in hundreds of Tesco and Sainsbury’s stores around the country until 13 July. In addition, a Chilled Exchange Truck will sit at the front of selected Asda and Sainsbury’s stores before the first England game on Saturday 14 June. Brand ambassadors will be on-hand in stores to encourage consumers to swap packs of beer for a chilled pack, ready to share at parties with their friends and family that evening. Thousands of cold packs will be delivered to shoppers across 40 stores throughout the UK. Sunny Bhurji, AB InBev UK’s head of trade marketing, said: "The experiential activity has been created to be innovative and engaging for consumers, while at the same time boosting sales. Experiential activity and live events are really important to Budweiser; they help create deeper relationships with consumers and showcase our World Cup campaign and the partnership we’ve had with the tournament since 1986." To find out more about Budweiser's experiential activity, check out the June issue of Event magazine, which features an interview with Jennifer Anton, marketing manager for the Budweiser and Becks brands at Anheuser-Busch InBev.